Jim Riches’ story is unbelievable and heartbreaking at the same time. I was interviewing him a couple of weeks ago on the occasion of the 10th anniversary of 09/11. The story appeared in the latest issue of the German GQ-Magazine. In the following you’ll find the translated transcript of Jim’s protocol as well as a video interview with Jim that lately aired on time.com. Translation of Jim Riches 09/11-protocol as published in the October issue of German GQ-Magazine. “I was off duty on 9/11 but once I saw the burning towers, I immediately knew my son Jimmy was on-side. We were talking on the phone just the night before. We’ve talked about his upcoming thirtieth birthday party which was scheduled for September 12th. In a police car with lights flashing we sped from Brooklyn to Manhattan – a privilege which I was entitled as a fire chief back then. During the drive I stared at the burning north tower and thought:”Jimmy, please get out there!” Once we’ve passed half of the Brooklyn Bridge the first tower collapsed. As a firefighter I immediately knew: my son was in there. But as a father I couldn’t believe it until I saw Jimmy’s Mercedes. With his top down it was parked in front of his firehouse in Downtown Manhattan. The fine dust of the collapsed towers covered the black leather seats of Jimmy’s car like snow. In a trance I’ve fought my way through the chaos and began to dig for injured people with the other rescue teams. Have you ever peed on the street? Come on, no excuse. I’m sure you did. Do I see you nodding yes? Cause if so, you are in huge trouble. At least if you live somewhere in the United States. ‘Cause obviously it’s a major crime here. You may wonder why I know that. So let’s just say a good friend of mine told me this story recently. Since it happened to him that he got apprehended by two NYPD police officers while peeing on the street. But this isn’t the most interesting part to the story. It’s more interesting that they handcuffed him right away and put him in their car – treating him like he’d killed somebody. So after a free ride in an NYC police car they took him into custody for an hour with the whole entertainment you might know from the movies. Ok, as far as I was told there were no mug-shots, but the poor guy was certainly forced to hand out all of his personal belongings such as his belt, scarf, wallet etc. After a questioning of 45 minutes, the guy was still handcuffed at the time, the officers sort of announced his plead: Guilty in first degree Public Urination. Hold on guys, the story gets better. After they released him, without bail thank God, they let him know that his crime will come to trail. Of course it will, since it was a major assault against the United States, its President and all United Churches within this God blessed country. But let’s rather stick to the facts within this pre-trial record: On July 21st at 9:30am there will be held a trail on this hideous crime. Until then, the defendant has to check in twice a week with his probation officer to discuss changes in his peeing behavior. Since of the incident the sidewalk moistener is only allowed to pee under the supervision of a state official. During his trial in mid July a jury is going to decide whether he has to serve a lifelong sentence in Guantanmo or is put on death row in New York City’s notorious Rikers Island jail which will rather be the case, since the authorities there just got rid of Mr. Strauss-Kahn and therefore can provide an open spot. Please be advised not to comment on this entry. All your statements can and will be held against you in the court of law. And don’t let the bed bugs bite. That’s a famous local lore in America and the bad news is, it’s quite true. What in Europe is considered to be the result of bad hygiene and usually only something a poor neighborhood has to struggle with is a very common issue in America. At least in metropolitan areas such as New York City where even the affluent snobs on 5th Avenue have to deal with these little freaking bugs. Supposedly it’s because the population in the city is so dense that these tiny creatures can hop from one coat to another in no time and find new homes to conquer the city every day. One tribe of them obviously must have a lingerie fetish since they moved into the Victoria’s Secret store last summer and made themselves at home there. The root of another tribe must go back to California because they decided to spread around the Abercrombie and Fitch store in SoHo while their relatives settled down in beautiful Nike Air shoe-lofts at Nike flagship store in NYC. So, you see, this bed bug thing is kind of serious in New York. If you are planning on coming to fun city within the next weeks please make sure you download this life saving iPhone App displayed above and teach yourself how to fight against these invisible but militant troupes. The war is on. Sharpen your teeth and get ready to bite back. The weather was pretty much like today on March 25th 1911. It was one of the first beautiful days in spring that year and lots of people were gathering at Washington Square. It was Saturday afternoon at precisely 4:40 when smashing windows and horrific screaming changed the scenery instantly. At the time then, most of the garment producers within New York were located in that area around Washington Square. So was the Triangle Shirtwaist Company, in the early 1900s the most successful blouse producer in America. More than 600 people were working for the owners Max Blanck and Isaac Harris in their Greenwich Village headquarter. Most of them 16 to 23 year old European immigrants, basically women. Lots of them were on duty at this fateful Saturday afternoon in 1911 and waiting for the closing bell that usually rang at 4:45. Only five minutes before they would have been off for the weekend, a gruesome fire inferno broke out in the eight floor of the ten story brownstone on the corner of Washington Place and Greene Street. Within minutes the fire was all over the place. Most of the dressmakers in the tenth floor could get out of the building by climbing through a hatch up to the roof where they later were saved by firefighters. But for most of the young women in the eight and ninth floor was no possible escape. The elevators in the building didn’t work any longer since the fire damaged the mechanic seriously. While some of the workers from the eight floor could escape through the staircase the tailors in the ninth floor where completely trapped. Somebody locked the door to the staircase there. As it was discovered later, the owners themselves did it to avoid theft. With no possible way out the dressmakers rescue depended on the firefighters. But their turntable-ladders were literally a dead end too, since they only reached between the sixth and seventh floor. While the fire got worse and worse lots of the young women began to leap out of the windows which implied the certain death since there were no reasonable life nets either. Dead bodies on the pavement of Green Street. Nobody of the leaping women survived. After less than 20 minutes the inferno was over and 146 people had died. 123 were young women. Although the tragedy paralyzed New Yorkers at the time, they began to change the unacceptable working conditions in the manufacturing companies around the city. Three month after the incident, John Alden Dix, the 38th Governor of New York, passed a bill that started the labor movement and finally established the “Fair Labor Standards Act” in 1938. In a sense the fire was a huge and gruesome tragedy that saved thousands and thousands life’s in later years. The brownstone where the Triangle Shirtwaist Company ran their business in 1911 still exists. Meanwhile it’s part of NYU. Right in these minutes where you’ve been reading this short abstract, hundreds of people gather in front of the building to commemorate the victims of the fire that happened 100 years ago today. Editor’s note: I just wrote about the incident in detail for German News Magazine Spiegel-Online. Click in and find more details about the Fire that changed America. Nothing seems impossible in the Land of Opportunity. I mean, they flew to the moon once. And there was this guy named Willis who prevented the entire world of the Armageddon in the late 90s, remember? Even Ronald Mc Donald was born here. So you see, there is nothing America fears. Not the moon, not meteorites and even not a guy who seduces its children with unhealthy food. Since of then I’m still asking myself where this fear comes from. Is it because there is a certain lack of control. Does a Nation that’s been always in charge of everything have trouble to deal with the uncertain? Maybe. The upcoming spring will hopefully bring some redemption and the climate change will do the rest to eliminate this threat for ever. But that’ll probably take another couple of years. We’ll see. 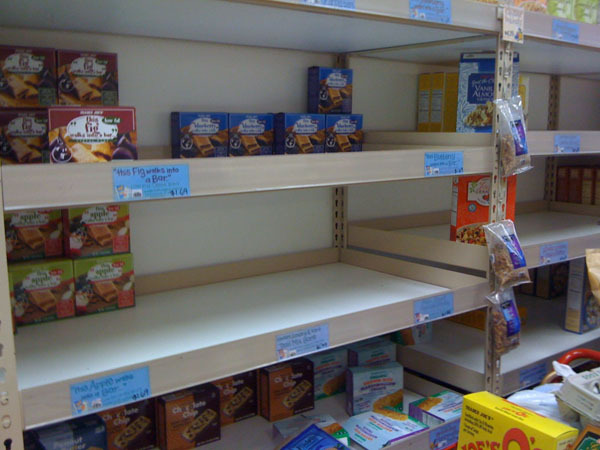 I don’t know about you but at least I grew up at a time where empty shelves in grocery stores were long gone. Of course, there were my grand parents who told me about the care packages and the food stamps they’d used after WWII. But that was a long time ago – I supposed. But it seems I was wrong all those years. 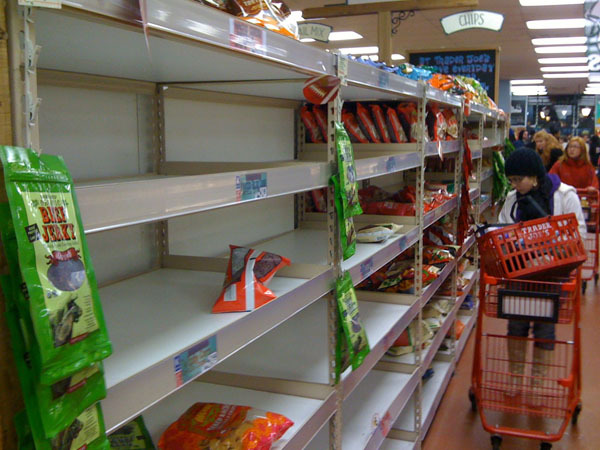 ‘Cause since I’ve been living in New York I see empty shelves in grocery store regularly. Every other week if you’d like so. As many other New Yorkers I still take my bi-weekly trips down to 14th street to get some affordable groceries at Trader Joes. You can get some decent stuff there: For instance cheese that’s less then 9 Dollars. Which would be the regular price in many other stores within Manhattan. But you have to have the luck of the draw while stopping by at the American version of ‘Aldi‘. 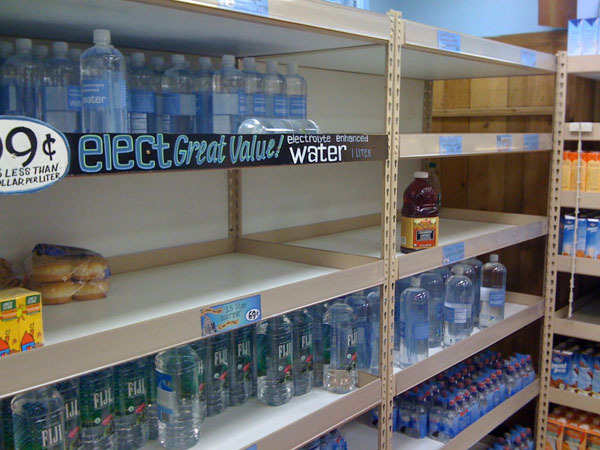 Cause if you are to late you’ll literally face empty shelves. And they are not empty because the service guy’s are lacy to fill them up again. They are sold out. Gone for the day. I took some pix there a little while ago just to convince you completely. Did you get these creepy goes-pumps already? Maybe this matter of fact leads to the conclusion that to live in a capitalistic society that’s out of control is as bad as to live in one which had to deal with the aftermath of a cruel dictatorship. Just a thought. It is one of the biggest sports events in the world with over 150 million expected viewers in 2011: The Super Bowl. A giant American tradition since 1967 when the first Super Bowl was played. Which had only 50 million viewers at the time. Meanwhile you’d need the entire population of Germany and France watching the same event to cover the current audience. But just to get this huge number a little bit more tangible: I’d estimate that more than 98 percent of those viewers don’t understand anything about the rules. Which narrows the audience down to the inhabitants of Berlin let’s say. ‘Cause most of the viewers just stick in front of the screen waiting anxiously of the guy with the white shoes. What’s his name – “Waterboy“, right. And honestly: I’m one of them. Cause the entire scenery looks more like a movie set to me. As a European I’m still not sure if this bowl thing truly is sports since they use radios to refine the games strategy while playing. Or is that because all those Americans can’t remember the purpose of the game after the first 15 minutes and someone has to tell them what to do? Just a guess. Anyway, this soup bowl event is an interesting thing nevertheless. And that’s because it comes with these commercial breaks. And that’s when the 150 million viewers are on the same page again. Why? Clear cut: Everybody knows naturally something about consumption. And that’s why every year the rate of a 30-second spot mounts up insanely. When the Super Bowl started in 1967 the average fee to air a commercial was $42K. This year its $3 million even. But remember – you’ll reach 150 consume professionals at once. That means we are talking about a $20 cost per mille, which is almost the same amount you’d pay for an average newsletter campaign. But this only as a side kick for all of you who need to convince a client to put on a spot for the Super Bowl rather than to blow off another email blast. I think I’ll have to change my name now since I made it official and compared the holy Super Bowl with email marketing campaigns for soup suppliers. Don’t judge me Americans, I’m a poor German lost in the futuristic surrounding of the new world. Radios, tz, tz, tz. The New Yankee – Who’s that? It's me - a German guy who's working in the media biz and currently living in New York City. If you want to get in contact with me, just send me a short note.